Cincom Systems recently developed a webcast featuring Gartner regarding how working with (or leveraging) dynamic languages can protect and enhance software development projects in a cost-conscious environment. In the webcast, featured speaker Thomas E. Murphy, research director at Gartner, discusses agile development practices and the economy, while Suzanne M. Fortman, Smalltalk STAR Team program director at Cincom, discusses how Cincom Smalltalk™ allows companies to quickly develop and deploy applications, which allows for faster return on investment and can help companies thrive in a tough economy and better position themselves for when the economy recovers. Based on current economic conditions, some companies have had to cut back on resources and projects, making it necessary to do more with less or do the same with fewer people. In terms of application development, this can mean that applications need to be built in a more agile way, which requires greater productivity, development-tool flexibility and with tools that allow for rapid inspection and feedback from consumers. As these agile development practices are utilized by more people, companies are looking for proven technologies that allow them to increase efficiency and effectiveness while reducing overall costs, according to Murphy. Companies are reassessing. [They’re asking,] what’s my portfolio? What are the technologies I have? Which places should we cut? What are the things we can do to help drive productivity, and improve or reduce my costs? That way I can in essence rough it out but not only rough it out in tough times but put myself in a better position for when the economy recovers. 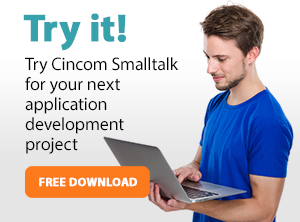 They’re looking for high-value, easy-to-learn dynamic languages that allow them to integrate a new project, while protecting their existing investments, Fortman said, something that the Smalltalk products–Cincom® ObjectStudio® and Cincom® VisualWorks®–can deliver. Companies are looking to reuse their current development tools and build on successful projects while saving time and money also. Smalltalk makes this possible.